A Very Thrifted Halloween (#2): Dress Like You Got the Power! Last week, I debuted "A Very Thrifted Halloween" where I curated a collection of thrift-inspired costumes / casual cosplay looks perfect for October or any other time of the year. The first installment demonstrated how easy it is to not only dress like a Final Girl, but how to make the ethical choice of thrifting your threads. This week we will continue to look at the ease of thrifting to embody the looks of your favorite characters with the theme "Dress Like You Got the Power!" Again, we are going to look at three variations of the theme and how you can pick up vintage pieces to personify each character. Our themes are: "Teen Spellcasters," "Mind Over Material Girls," and "Paranormal Magnets." One would think that being a witch would make being a teenager easier - however as Louise Miller (Robyn Lively) learned, with great power comes great responsibility. True, she could make life a little easier and without her, Polly would never had an awesome rap battle (Top That!). After ups and downs, Louise discovers popularity might seem fun, but it is no match for the true gifts of real love and friendship, especially when no magic is required. Louise's powers give her confidence, especially in taking her style to the next level. She isn't afraid to rock her tutus and flair even when the popular girls want to be her best friend. When searching online, the 90s are closer to Louise's wardrobe (was that due to her magical powers?) than the 80s. She has many great looks to pull from, including her blue formal dress at the end. However, one of her day looks may fit well into your everyday cosplay, in addition to Halloween. A denim vest, a tiered ruffled skirt, and a triangle necklace with a stone easily will transform you into this quirky and charming Teen Witch. Add a few bangles and other shiny accessories and you are ready to cruise the city on your bike to meet up with your dream boy Brad, no love spells required. Other "You Got the Power, Teen Spellcasters": Willow Rosenberg (Buffy the Vampire Slayer), Mildred Hubble (The Worst Witch), Hermione Granger (Harry Potter). 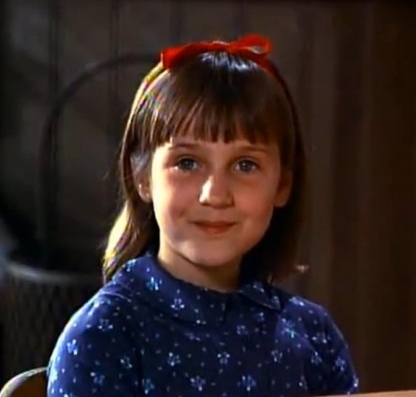 One of my favorite girls with telekinetic power (ability to move objects with one's mind) will always be Matilda. My love started with Roald Dahl's 1988 novel, but for the purposes of this piece I will use Mara Wilson's version of Matilda from 1996). Whether you are feeling bookish or your intellect and surroundings have you leaning toward the mischievous, then this look is for you. Pair a blue print dress with a red headscarf and a pair of black flats, and boom, instant Matilda. As Matilda says, "Never do anything by halves if you want to get away with it. Be outrageous. Go the whole hog. Make sure everything you do is so completely crazy it's unbelievable...” Therefore, try with all your might to also harness her mind powers to complete this look, and of course, find yourself Miss Honey (because everyone needs a friend who is a positive influence in your life). Other "You Got the Power, Mind Over Material Girls" options: Jean Grey (X-Men), Carrie White (Carrie), Lucy (Lucy). Lydia (Winona Ryder) was an instant favorite of many teenagers, including myself. She has a goth personality and gravitated to the dark and macabre, but still had passion for photography, poetry, and her ghost friends. Like many teens, she wanted her parents to notice and listen to her. She wanted friends who got her - whether they were alive or dead. Unfortunately in that quest she gets mixed up with a certain "ghost with the most," Beetlejuice, who you guessed it, did not have honorable intentions. Luckily for Lydia not all ghosts are bad, which is why I decided out of all the outfits for Lydia, I went with the black ensemble she is wearing when she meets her new home's resident ghost and former owners Adam and Barbara Maitland for the first time (other favorites include a red wedding dress or school uniform fit for supernatural dance parties). This look requires three key pieces: a black straw wide brim / panama / sun hat, a black dress that is slightly loose fitting, and a camera (I chose a vintage camera necklace as this is something you can wear easily for everyday cosplay). As long as you stick with singing "Jump the Line" instead of saying the B word three times, you should be safe from sand worms. Other "You Got the Power, Paranormal Magnet" options: Dana Barrett (Ghostbusters), Kathleen 'Kat' Harvey (Casper), Diane Freeling (Poltergeist). There you have it: "You Got the Power" three ways. Three looks to embrace this Halloween or any day for that matter. They are easy to thrift, easy to wear, and items you can use over again with your current wardrobe. If you have a another favorite You Got the Power, please let me know in the comments below. I hope to see you next week for our third installment, which will again provide three different takes on a theme with three items you can easily thrift for the look.